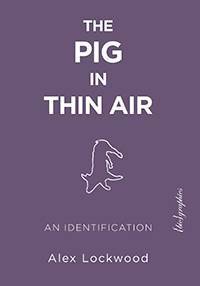 The Pig in Thin Air By Alex Lockwood, Ph.D. In this searingly honest account of how he came to terms with his destructive habits and changed his relationship with his own body, Alex Lockwood—writer, educator, and activist working in the fields of literature, creative writing, media, and the environment—critically explores the relationship of the body to animal activism. Looking at academic scholarship and animal advocacy organizations, Lockwood explores the dimensions of embodiment from his own body to those of the animals he bears witness to, from bodies of knowledge and those who place themselves in the way of the machinery of death, through to our physical efforts to make sense of a world where so much is desensitized, disembodied, and fragmented. In exploring different modes of activism throughout North America, The Pig in Thin Air asks how animal advocacy and environmental activism can best join forces to tackle these interconnected crises in such a way that we might develop deeper, more authentic compassionate relationships with all other animals, including ourselves.